The other day, the moon, sun, and stars lined up to just be one of those days for Caden. It was going to begin with an early morning dentist appointment and conclude with a late afternoon doctor appointment. Either one of those things can lead to major challenges and meltdowns, particularly when there are always just so many unknowns. Caden’s first dentist appointment was about 5 years ago, and to say it was horrific would be an understatement. It took 4 of us to hold him down long enough for the dentist to pronounce we weren't cleaning his teeth well enough and that he felt holding him down was less trauma than the impact of not getting his teeth clean enough. I disagreed with all my being because I knew that in time Caden could and would learn that brushing his teeth was a safe activity, but if we used the hold’em down method he would only learn fear and we’d never make progress. So we didn’t go back to that particular dentist, and we continued to follow our gut instinct. Although we continue to help him brush his teeth, he now brushes twice a day without argument. Best yet, he was able to sit in the dental chair by himself and get his teeth checked and cleaned without a single argument or tear. I on the other hand sat at the bottom of his chair with Elf and fought back proud tears of how far he had come in such a short time. Yet, in that short time, I know how hard he has worked and continues to every day. Honestly, he has come farther in the dental world than I have; I still struggle to the point of tears every time the dentist is mentioned due to my own dental phobia. Even taking the kids to their dental appointments is difficult for me. He’s truly my hero, and I am realizing how much I need to learn from him in regards to overcoming my fears. Later that day, Caden, Elf, and I headed to the doctor to investigate some ongoing stomach pain. I expected a quick exam and out so that’s all I had really prepared Caden for. He was already claiming it was the worst day ever because he had to go to the dentist and the doctor, but little did either of us know that the worst was yet to come. The doctor decided to order bloodwork and x-rays. We weren't prepared for bloodwork so we didn't have any emla (numbing) cream with us nor any of Caden’s usual needle comforts. He walked back to the bench though and proclaimed that he wanted the needle put in slow and that he was watching his Ipad, and that’s exactly what he did. There wasn't a single tear shed and no one had to hold him down. I would have been over the moon at that point, but then the phlebologist have asked Caden what grade he was in. He replied 2nd, and again I was doing a mental happy dance because he was appropriately responding while getting his blood drawn with no tears and no one holding him down. The tech, however, decided to state over and over again that 2nd grade didn’t make sense for an 8 year old; she proclaimed rather forcefully that he should be in 3rd grade. I was fighting back tears and an overwhelming desire to punch her because I didn't want to have to remind Caden that he stayed in Kindergarten a second year because it was such an emotional experience for him. Caden however never missed a beat and replied I stayed in Kindergarten an extra year because my teacher Miss J needed a special helper with the little kids. Never ever take for granted what a lasting impact teachers can have on your child. I've never been more grateful for Miss J and all of the teachers out there who work so hard to remind our kids how special they truly are. The day kind of spiraled for me from that point. First the x-ray technician refused to believe that service dogs were for anything but the blind. I had had enough by that point, and rather calmly but forcefully recited the ADA law to her and gave her a quick and dirty education on autism service dogs. Needless to say, she let us stay in the room for the x-ray although we stepped behind the shield to protect Elf from exposure. Once again, Caden amazed me by laying still, not freaking out when the technician had to position him, and handled it all without a single tear. Before we were able to exit the hospital, we had one more incident. Elf and I walked out the regular doors, but Caden wanted to take the roundabout door. He got stuck and scared and neither of us knew what to do. The volunteers and security guards just stood there and watched; thankfully, a kind woman walked into the next section of the roundabout and got the door moving again so that Caden could exit. Afterwards, though, all he said was well that was an adventure. Don’t get me wrong we still have our challenges every-single-day. The countdown to Christmas was almost more than he could handle as positive anxiety is just as hard as negative anxiety for him in many regards. We are back to starting out on the living room floor (a place he has always felt safe sleeping) and then moving him to either our bedroom floor or his own bedroom later in the evening. He’s struggling with a few things in school like how to expand on descriptions (a process that he says makes his brain hurt) when he’d rather have a literal straight forward short but sweet description, and the re-introduction of cursive isn’t any more successful than when we first tried it. And I’m sure there are dozens of other things I could list here. But the thing is that he continues to face his challenges with the smile and giggle that only my giggle monster could do. He finds the funny in the day, and he finds a way to have fun every day. Sometimes he has to ask to go to his room to “find his emotions” and other times he asks us for help. Sometimes he spins for a while, and other times he dances until he feels better. You know though, I've realized that sometimes sitting in my chair at work and spinning does relieve some of the stress and that dancing does make you smile so maybe he is onto something here. I think once again he has proven that I have as much, if not more, to learn from him than I will ever be able to teach him and I’m good with that. I can't imagine a better teacher to open my eyes to the world than my blue-eyed giggle monster. So you are probably thinking that I abandoned you. I had grand ideas of blogging while we were in China, but between internet problems and scrambling to stay caught up on everything, I really didn’t have the chance. Then we got home, and honestly three kids is a lot harder than two—I think there is a lot of truth in that “joke” about what happens when the kids outnumber the parents. Sayre was placed in my arms on July 28th, and we arrived back in Chicago on August 8th. Honestly, it hasn’t been the fairy tale that I imagined; some days I’ve wondered what I did to my “perfect” family, some days I’ve wondered if I really can/do love my newest little boy, and some days I’ve wondered how in the heck we are going to survive this newest adjustment. At times, that is all terrifying and overwhelming, and then there are those little moments---a hug, a kiss, a sweet little voice calling “mommy” that remind me there’s no other journey that I’d rather be on. It also reminds me of the moments/days/weeks that followed Caden’s diagnosis with Autism. I worried over the lack of services, if he’d ever be able to attend school, and if he would have anyone to call friend. I still wake up in the middle of night worried about bullying and how he will cope in this world with his sensitive nature. Once again, though, the fears and difficulties are tempered by the beautiful moments: listening to him read the titles of songs off the TV station while he is going to sleep, watching his eyes light up when his friend walks in the door for a play-date, or seeing what a kind and caring big brother he has become to Sayre. See that’s the thing about the kids. They have accepted Sayre into our family, as their brother, since moment one. There’s never been any hesitation, doubt, or fear over their feelings or how he came to be a part of our family. Caden gets so excited when he sees or hears something about China because that’s where his baby brother is from. Ryley proudly shows off her brother to her friends without hesitation over the fact he looks different or has some physical challenges (arthrogryposis, wind-blown hands, and bi-lateral club feet). I don’t think they are in denial over the challenges ahead, but they are living the journey and know that the road is filled with ups and downs and twists all around. Adoption, like being a special needs family, isn’t always easy. Sometimes the challenges seem insurmountable and the smallest thing sets off tears. And then just before all turns dark, there’s one of the moments that make it all worth it. Sometimes it is a silly moment—Sayre wanting to play with Caden’s clothes even if Caden isn’t ready to take them off and sometimes it is a sweet moment—the boys playing in a laundry basket together or hearing I love you from any one of them. I’ve always said that sometimes the stories are funny and sometimes they are heartbreaking but they are all just a part of Caden’s tale; maybe the reality is that they are all just a part of our story. The thing about our story is that it is ours and even with all of its imperfections, it is the perfect love story for us. I should admit that I am a bit of a mess right now—adoption hormones don’t seem to be that much different than pregnancy hormones. Some poor person had the nerve to mention to me the other day that adoption was the easy way of doing things, and while I won’t repeat my response to her, I will just say that speaking slowly and carefully to me for the next few days is probably best for everyone around me. Seriously, I should come with a visible “adoption in process momma” warning sign. After a year of talking about adoption, the time is finally here. On Wednesday, Ryley and I leave for China. We will arrive on Thursday; Sunday we will travel to Sayre’s province and he will be given to us on Monday. The adoption will be finalized on Tuesday, and we will spend the rest of that week finishing up passport paperwork before we travel to the location of the U.S. Embassy for medicals and visa paperwork. We will take a van to Hong Kong on the 8th to catch our flight back to the states. Although I hate being away from my boys, I am so excited that we will be back on the 8th for Dan’s birthday (and our 9th anniversary) and we will all be together on the 9th for Ryley’s BIG 14th birthday. If you have followed my blog for anytime now you know that Ryley and Caden’s birthdays are huge deals in our family. Whenever doctors tell you your children won’t live past a certain age you celebrate each and every “extra” year like crazy! Having said all of that, I am a nervous, anxious mess about this trip. I have been doing a lot of thinking trying to pinpoint exactly where my nerves are coming from, and I have come to an interesting conclusion. When Caden was diagnosed with autism, we became an autism family. As such, we spend most of our awake time previewing what is going to happen that day, that week, etc. Everyone in our household now speaks in “first, second, then” statements. Other than medical stuff, there aren’t a lot of unknowns in our household or at least we try to prevent/reduce them as much as possible. Predictability is our friend, and along with the super service dog Elf it greatly reduces meltdowns over fear, anxiety, and frustration in our household. I didn’t realize, though, how much our daily interactions have changed me—I didn’t realize that I started to crave, even need, that level of predictability and control in my own life. While this is creating a lot of unnecessary and unwanted discomfort about the upcoming trip for me and the entire process Ryley and I are about to go through, I think in some ways it is a good experience for me. It is forcing me to live in a little piece of Caden’s world and see the world through his eyes for a short while, and hopefully I can learn from this experience coping techniques that I can then share with him. Maybe, just maybe, this adoption process will make me a better autism mommy. I can’t help but wonder if some of my autism mommy lessons won’t help prepare me for family day with Sayre and all of the feelings (fear, loss of control, lack of language) that he is going to be experiencing. Maybe, just maybe, this entire life is working out exactly the way that it is supposed to be with one event informing other events that we encounter. 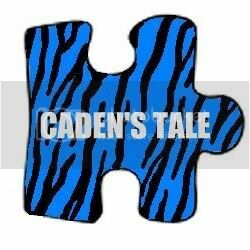 Maybe it is all really meant to be a part of Caden’s tale. Our venture into virtual school with Caden this year has been chock full of learning experiences for Caden and for us as his learning coaches. I think the fact we are both educators makes it a bit easier for us to hold the line when we know the answer he is about to click is wrong. It was a struggle early in the school year, though, to let educator rationality overrule parental instinct to protect him from disappointment. Early on, he didn’t understand why we let him pick the wrong answer, and there were a lot of “learning” conversations. A few months into the school year, though, I think we all found our groove, and we all realized that we had made the correct educational choice for Caden. Along with the content material he has learned, he has also learned that sometimes you get the right answer and sometimes you get the wrong answer. Sometimes you are allowed to correct your mistakes and sometimes you just have to accept the grade that you have rightfully earned. We love the concept of correcting mistakes, and whenever that option is given to either of our children by their teachers, there usually isn’t an option---they need to make the best of the opportunity given to them. This is non-negotiable; well, usually. In Language Arts, Caden had to write a poem. I admit that Dan and I were sweating bullets wondering how Caden would handle this particular assignment. He is a black and white completely literal child; adjectives and adverbs have little place in his vocabulary. A flower is a flower---state the obvious and move on. Caden really wanted to try the assignment, though, and several days later after much blood, sweat, and tears he had a 4 line poem that he couldn’t wait to read to grandma and grandpa on the phone. He showed it to every therapist who walked in the house, and he even memorized the poem that he had written. I’m sure he was more excited to submit this poem than any other assignment this year, and he asked every-single-day if it was graded yet. When the grade came back, though, his grade was disappointing. In fact, it was one of the lowest grades he earned all year. During his next teacher phone call, his teacher explained that he hadn’t included enough description and he needed to include more rhyming words. Her criteria were clearly explained, and for all practical purposes he didn’t meet the standard that she had set. From our perspective, it wasn’t an IEP violation as we didn’t request an assignment modification before he began the assignment. There wasn’t anything unfair or discriminatory about the grade; he simply hadn’t been able to demonstrate the skills his teacher needed to evaluate. His teacher, however, knew how much the poem meant to him, and she offered to let him re-do the assignment and she would re-evaluate his grade. As I said before, we have never turned down this type of opportunity for either child before. And yet this time, with this assignment, we chose not to have Caden rewrite his work nor did we even tell him that it was an option. Caden willingly shared his poem with anyone who would listen to it; he even memorized it. He worked so hard copying it for the final version because the poem was special to him. In fact, when I complimented him on the poem, he responded by saying, “I am proud of me too mommy.” That statement is worth more than any grade ever will be because it was said with complete genuineness. I think it is hard for anyone to admit that they are proud of something they have created, and it is even harder to maintain that pride when criticized by those around them. Now add to the equation a child who struggles with esteem and anxiety, a child who can’t handle compliments and often sees grades as indicators of academic self-worth. That same child said he was proud of himself and that he liked his poem. Not to sound like a cheesy commercial, but that statement is priceless and represents so much more about this last year than a single grade ever will. Don’t get me wrong---we get that he needs to work on descriptive language and it is a new school support goal for his therapists to work on this summer. We also realize that at some point we may have to start asking for assignment modifications as he moves into more complex subjects that require a type of thinking that is different from the way his brain operates. But for now, I can’t help but think that possessing those seeds of self-confidence is something so much bigger than any educational or therapy goal that we have ever written or asked for. My journey into motherhood started with a case of “the flu” that just wouldn’t go away. I didn’t really ever plan on having children, and then 7 months later I couldn’t imagine my life as anything but a mother. From juggling a full-time doctoral program to becoming the mother of a special needs child, I found my role as a mother constantly being challenged and changed. The challenges and changes only continued with divorce, dating, and eventually remarriage. My growth (and mistakes) continued with becoming the mother of two--the mother of a son and the mother of a child on the autism spectrum. I expect my role as a mother to continue to evolve with each new stage of my children’s development. I even expect there to be things that I’m not prepared for or aspects that I don’t particularly enjoy. When we made the decision last summer to adopt, I knew that journey would also come with a new definition of whom and what I was as a mother--the mother of an internationally adopted child, the mother of three. As I start to think, though, about traveling this summer to pick up my adorable little boy, I am faced with the knowledge that I am about to become a part of the history of his mothers. I am struck by the enormity of the privilege and responsibility that I am about to have. I am no longer acting on behalf of simply myself, but I will be representing the triad of his mothers. I have an obligation to convey my honor of his birth mother and what an emotional process it must have been for her to give up her child, either due to familial or societal pressures or maybe it was because she didn’t have access to the resources necessary to provide for his medical needs and knew that leaving him was the best thing she could do for him. I will never be able to let her know how much I love him or how hard I will work to fulfill the hopes and dreams that I’m sure she had for him. My responsibility doesn’t end there, though. There is his foster mother who he has spent the last year or more with. She has given him a place in her family and her heart with the full knowledge and commitment that she would one day hand him over to government officials who would in turn give him to his forever mom. She has watched him learn to sit up, crawl, and take his first steps. She has given him countless bottles and soothed him after bad dreams. I’m sure she has thought of his future and wondered and worried if his forever mom would figure out the little things that comfort him, his favorite foods, and what his fears are. I can’t promise his mothers that I won’t make mistakes or even that I will learn from my mistakes on the first try. I can’t promise that I will do mothering the way that they would have if he could have stayed with either of them. I can’t even promise that I will always have the answers to the hard questions that he will inevitably ask. I can, however, promise that I will love him with all of my heart, and I will learn how to be the person that he needs me to be. I can promise that I will always speak with honor and respect when he asks those questions about his mothers. I can even promise to keep looking for answers for him although I know they don’t exist. I will always have an open heart and arms for comforting him when inevitably tears fall in grief or anger when he too realizes that no answers exist. I promise not to turn away nor hide my own tears the day that he rages against me for taking him away from his mothers and those answers. I promise that he and I will get through all of this, and we will both be stronger because of it. I promise to be there in the morning, in the afternoon, in the evening, and in the middle of the night even when I need to stay in the shadows because he thinks he is old enough not to need me anymore. I promise to be there when he realizes that you are never too old to need your mother. And maybe the most important promise that I can make to his other mothers is that I will always love him to the moon and back. Recently my daughter was hospitalized for an autonomic crisis; she was incredibly sick and stabilizing her took 4 different medical teams, a lot of tests and procedures, and a few days in a hospital an hour away from home. Coming home meant accepting that she needed a Nasogastric Feeding Tube. An NG tube is essentially a flexible tube that is inserted up the nasal cavity down through the back of the throat into the stomach opening; it can be used for fluids or liquid nutrition. Because my daughter doesn’t need one 24/7, I had to be trained to insert and remove the tube as we need it at home. A 13 year old has so much to figure out about their identity and place in the world that anything extra that makes them different is a challenge; especially when that difference is a tube taped to the side of your face. Come on, think about how you felt when you had what you were sure was a mountain size zit on your face and you had to go out into public. It is also emotionally draining to deal with a major illness that may well be a life time long struggle and the frustration of being poked and prodded for days. I know that she has a lot to work through and honestly I wouldn’t even presume to be able to make assumptions about that process for her. But I can tell you about my feelings. I am often reminded that special needs parents are “stronger than you think possible” to which I usually want to reply were we given a choice? But in this instance I do have to agree that we find strength where it doesn't seem as though any exists. During our hospital stay I smiled and took notes as each team of doctors came in and asked the same questions over and over again and explained what their plan for the day was. I tried to maintain my manners with each nurse or technician who came in no matter how tired or frustrated I was. I gave quiet assurances to those who called or texted for updates. I was, for all practice purposes, the super mom that is often alluded to by those outside the special needs community; you know the handle it all with a smile and lots of coffee on no sleep mom. That’s the story we perpetuate in our circles; meme after meme visualizes the stronger than you think possible mantra for us. And for the most part, it is true. But I think it is equally important that we share the other side with parents who might just be entering the special needs world. See sometimes you keep smiling and saying you don’t need anything to each person who walks in that hospital room when inside you are screaming I feel like I am about to fall off a cliff and I don’t know what to do. Sometimes you can’t wait for your child to fall asleep for a while at night so that you can cry silent tears while surrounded by medical beeps and hums. You might find yourself walking out of the room at 2 in the morning desperate for a breath of air only to find yourself holding a stranger whose language you might not even speak because in that moment they can’t find all of the strength that they need for their child. You look for outlets that make no sense to anyone outside of the hospital experience—a free washer and dryer on your child’s floor or a blanket, sheet, and pillow for the parent cot. Don’t even get me started on the joy of nurses sharing the free floor coffee pot with you (I’ve been known to tell a nurse or two that I love them over caffeine in the middle of the night). Then there’s the story about your child that doesn’t get told enough. It is the story where they are angry or frustrated or scared and you are their safe place. As their safe place, you are the target of their anger, frustration, or fear. Sometimes that means they want you to hold them and sometimes it means they either won’t speak to you or their only words to you are those of hatred. You know they don’t really mean it but you’re tired, overwhelmed, and worn down enough that it shatters a piece of your heart even though you’d never burden them with that on top of the struggles they are already facing. But if I am completely honest, in that moment you will feel loneliness like you have never experienced before and it hurts like nothing you will ever have ever experienced. And at that very moment it doesn’t feel like you are very strong. It is in that moment that you need to have heard stories from others who have been there, others who can admit that it is okay to feel less than strong. It is okay to be hurt or overwhelmed or weary to your soul. Often times we don’t really see the strength until we are through the struggle; survival mode doesn’t allow us to be very reflective. We don’t see the strength or the light at the end of the tunnel until we are on the other side of whatever it is that we are facing. In the moment of crisis, it is without a doubt all about your child and what he or she needs and what you need to do to make that happen. But I think we need to remind each other that afterwards, it is okay, healthy even, to reflect upon our own feelings throughout the process. Just like any wound, your feelings need a chance to be soothed, bandaged, and allowed to heal. Experiences, hurtful or otherwise, do make us stronger but it doesn’t happen without a few scars. If we truly want to mentor others through the special needs experience we need to share our own scars and help other parents see the beauty in the ones of their own. These scars aren’t failures or a sign of lack of strength; they are proof that we have walked the battle grounds and survived and will be able do so again as need warrants. They are the true badge of exactly what we will endure for our children and they show that like our children we are warriors. On July 25th we officially submitted our adoption application to CCAI. Once accepted, we submitted our application to Crossroads to complete our homestudy. Then, we moved full steam ahead until that “little” emergency surgery incident of mine abruptly stopped everything for a few weeks in September. Thankfully, we were able to do our adoption training online so that saved us a lot of logistical problems that we would have otherwise had. We started moving forward only to get held up by Adam Walsh background checks. Those should have taken a few days, but ended up taking a few months, which in turn held up final approval of our homestudy. Everything about adoption is time sensitive so we decided to “seal” the documents that we had collected thus far so that they didn’t expire while we were waiting for homestudy approval. Sealing essentially means having everything notarized locally, sending it to the state to be verified, then the State Department for further verification, and then final approval at the Chinese Embassy. Needless to say, we are keeping Fed-Ex in business at the moment. Anyway, we were feeling pretty confident when we sent our police reports (which ironically are different from the Adam Walsh fingerprint checks and the Immigration/Homeland Security fingerprints), medical reports, employment verification, assets verification, adoption petition, birth certificates, and marriage certificate off to Washington. And then they were all rejected at the Embassy. According to our courier service, this was the first time he had seen this in 17 years. One of our notary seals was about ½ inch off from where the embassy wanted it to be. The State Department was awesome about moving several of the seals for us, but unfortunately 4 of the 11 documents couldn’t be saved. The upside is that they were ones that were fairly easy and affordable to replace. Meanwhile, we had to Fed-Ex another cashier’s check out because the Embassy only accepts exact payment. This caused some (i.e. a lot of) tears on my part until I came to the realization with the help of our awesome dossier consultant, Sarah, that every family encounters a problem during the adoption process. Although this does set us back a bit financially, it didn’t happen after we had a match and were counting down to meet our child, it didn’t require us spending several extra months in another country, and it isn’t costing us thousands of unplanned dollars. All-in-all, this was a fairly benign oops in the grand scheme of things. While all of this was happening, our Adam Walsh background checks came back and our homestudy was finally approved. We were then able to send off our I800a, which is our petition to Homeland Security/Immigration to adopt internationally from a Hague certified country. They texted us to let us know that they had received our application, and then approximately 2 weeks later we received a letter letting us know that we had our biometrics appointment scheduled for January 3rd. So on Friday we all headed to St. Paul for our biometrics appointment. They actually request that only those with an appointment attend, but honestly we didn’t have a babysitter and figured we just stand if there was an issue in the waiting room with 4 chairs instead of 2. We arrived at the designated location only to find that they had moved. Thankfully, we found them a few blocks up the road and then things got a bit interesting. Because they are a federal building, service dogs are not permitted. On top of that, no electronics are allowed either. So we had a child who was absolutely devastated that he didn’t have Elf with him (he kept repeating “but he is a service dog” over and over again), and didn’t have any of his distractions with him either. Big sister was trying desperately to get over a nasty GI bug that didn’t improve much with a 2.5 hour car drive, and oh I didn’t have a voice as a result of serum sickness from an allergic reaction to penicillin. It is safe to say we made an impression on Homeland Security! Honestly, though, the kids did well, although Caden did melt down once we were back in the car because he leaned over the seat to say hi to Elf and once again realized he didn’t have his “bestest friend” with him. And then we drove home in high winds and blowing snow. It is fairly interesting though how a 5 hour drive with our children can make us wonder what the heck were we thinking when we decided a 3rd child was a good idea. Now we wait for Homeland Security/Immigration approval, which we have been told could take a few weeks or a few months. Our papers are on their way home from D.C., and we have recollected the 4 rejected documents. They, along with the homestudy and the Immigration approval, will need to be sealed, although they won’t have to go to the State Department; they can simply go to the Embassy in Chicago, which Dan will probably drive down himself or we will lovingly talk family into delivering for us since documents can no longer be mailed into the Embassy. I would have loved to have been able to travel this summer, but as with all things in the Caden’s Tale family, things will happen exactly when they are supposed to, probably at the most inconvenient time possible, and it will all be perfect.